It contains: 1 color label - 2 tubes - 1 picture - 1 font. The tubes are by Leny and Tiny. Set your foreground color to #e7e7e7. Set your background color to #7b7c7b. Set your foreground to gradient 'Radial' - Angle 45 - Repeats 3 - Invert not checked. Open a transparent image of 600 x 400 pixels. Effects - Plugins - Xero - Fritillary - default settings. Copy tube 'waiting for Sinterklaas 5 and 6 nm2 tinytube'. Place this tube on the left side - see main image. Vert and Hor 6 - Opacity 45 - Blur 10 - color black. Image - Resize - 1x with 75% and 1x with 85% - All layers not checked. Place the puppy left below - see main image. Image - Color depth eapand - 16 million colors (24bits). Image - Add borders - Symmetric - 2 pixels - color black. 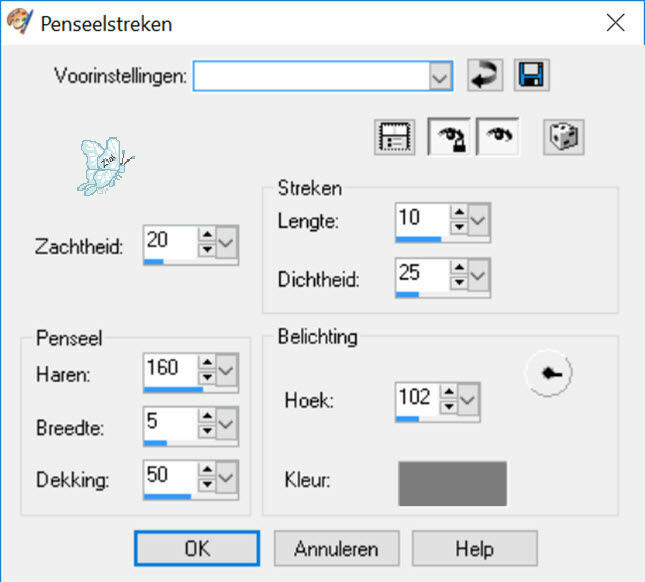 Image - Resize - 65% - All layers checked. Copy this picture with Shift+D - minimize the copy for now. Activate your Text tool - font 'Kaixo' - Size 16 - Strokewidth 0. Type 'Children hoping for the Sint'. 'Sint hopes for better weather'. Image - Add borders - Symmetric - 2 pixels - color #ff0000. Image - Add borders - Symmetric - 20 pixels - foreground color. Effects - Plugins - Xero - Cubism - default settings. Save your crea as a jpg file. If you don't want to animate, you're done! Open your minimized image (step 4). Layers - Duplicate - repeat 1x. Close the 2 top layer. Adjust - Blur - Motion blur - Angle 150 - Strength 40. Effects - Plugins - VDL Adrenaline - Snowflakes - Random Seed to 10. Effects - Plugins - VDL Adrenaline - Snowflakes - Random Seed to 20. Open and activate layer 1. To AS: Edit - Paste - As a new animation. Open and activate the middle layer. To AS: Edit - Paste - Before current frame. Open and activate your top layer. To AS: Edit - Paste - Before active frame. Click in frame 1 - Edit - Select all. Open the crea you saved in step 7, in AS. Edit - Duplicate selection - repeat 1x. You image has 3 frames. Back to your main animation. Edit - Paste - Into selected frame. Place the rain picture exactly over the rain picture on your crea. If you are satisfied, save your crea as a gif file and you're done!